As a half-dozen bishops celebrated Mass at a church on Capitol Hill before beginning a day of lobbying members of Congress on immigration reform, the event itself gave a sense of the many layers of effort they were undertaking. Songs were led by a multicultural choir in a half-dozen languages. The preaching was in English. The congregation consisted largely of people who work for organizations involved in advocacy for immigration reform and included three high-level White House staff members. And the majority of reporters at a news conference afterward were from religious or Spanish-language media. The bishops were scheduled to meet with House members from their home districts, among others, and to conclude their day with House Speaker John Boehner, R-Ohio. Boehner has said he would not bring an immigration reform bill passed a year ago by the Senate onto the House floor unless it had the support of a majority of Republicans. Advocates believe there are enough Republican supporters of the bill for it to pass, along with the votes of nearly all House Democrats, although there is not the majority Boehner seeks within the Republican caucus on its own. In his homily, Miami Archbishop Thomas G. Wenski compared the current immigration law to the British taxation that led patriots to toss tea into Boston Harbor; to the civil disobedience of Rosa Parks, who broke the law that required her to give up her bus seat to a white man; and to Jesus' response to those who accused him of breaking Jewish law by healing people on the Sabbath. "The Sabbath was made for man, not man for the Sabbath," Jesus said, according to the Gospel of Mark. "When laws fail to advance the common good, they can and should be changed," Archbishop Wenski said. "Outdated laws, ill adapted to the increasing interdependence of our world and the globalization of labor, are bad laws," he said. But, he warned, substitutes for bad laws are no improvement if they fail to take into account both human dignity and national interest. Archbishop Wenski further compared the immigration situation to that in Victor Hugo's 19th-century novel "Les Miserables," which tells, the archbishop said, "how pride and neglect of mercy represented in the bitterly zealous legalism of Inspector Javert ultimately destroys him. Today, modern-day Javerts, on radio and TV talk shows, fan flames of resentment against supposed law breakers, equating them with terrorists intent on hurting us." He continued: "However, these people only ask for the opportunity to become legal and have a chance for citizenship -- to come out of the shadows where they live in fear of a knock on their door in the dead of night or an immigration raid to their work place." The Mass at St. Peter Catholic Church, a couple of blocks away from the Capitol, was concelebrated by six bishops and another half-dozen priests. Most of the bishops had participated in a Mass at the Mexican border in April, held in support of immigration reform, in memory of migrants who have died, and in solidarity with families torn apart by deportations and immigration policies. At a news conference after the Mass, Bishop Gerald F. Kicanas of Tucson, Arizona, talked about the kind of lesson the bishops learned from their visit to the border and what they would communicate to the members of Congress they were to meet. In addition to the Mass at the border fence in Nogales, in Bishop Kicanas' diocese, while they were in Arizona the bishops walked through the desert along a route used by migrants. They also met with the Border Patrol, served dinner at a soup kitchen for people who've been deported, met with deported women in a shelter in Mexico and toured the office of the Pima County medical examiner who tries to identify bodies found in the desert. "When someone meets a migrant and hears his story, listens to his struggles, it has a powerful effect on changing one's thinking," Bishop Kicanas said. Auxiliary Bishop Eusebio L. Elizondo of Seattle, who chairs the U.S. bishops' migration committee, said he had just returned from meeting with bishops of Latin America, many of whom expressed their concern for the treatment of their countrymen as they try to better their lives by getting to the United States, and for the families broken apart when someone is deported. 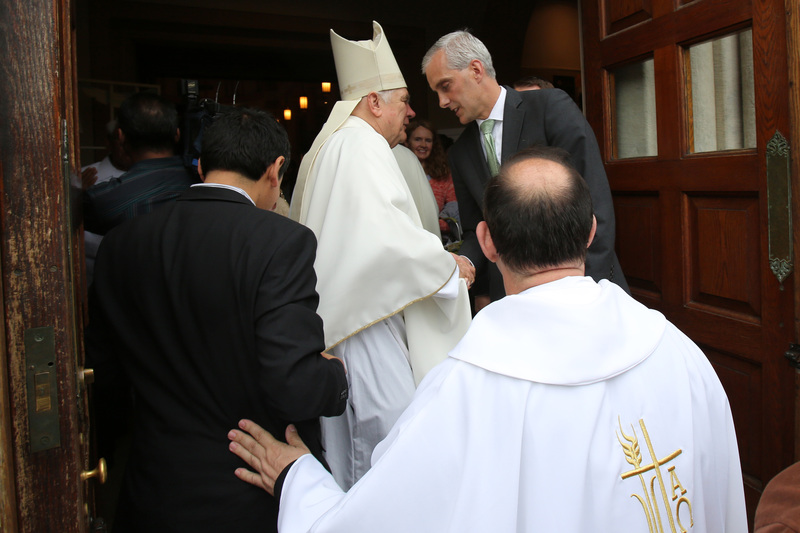 At St. Peter Church, one question put to the bishops was "is it immoral to disagree with you?" The reporter suggested a different position on immigration reform was "a matter of prudential judgment." The morality of the bishops' approach to immigration comes from the Gospel, Archbishop Wenski said. "I was a stranger and you welcomed me," he quoted Jesus saying. "The prudential part comes in how we act on that." Bishop Kicanas said the approach taken with people who disagree is key. "It's important not to demagogue people who are fearful or angry" about immigrants. "It's important to be with them, and to help them see the Gospel message." Bishop Oscar Cantu of Las Cruces, N.M., who also was at the border Mass, told Catholic News Service after the news conference that the experience at the border added a sense of urgency to addressing immigration reform. In his diocese, he said Catholic Charities deals all the time with families who are divided by someone's deportation. But the walk the bishops took through the desert "was very powerful" in illustrating what risks people are willing to take to escape poverty and violence in their home countries. "People are not coming because it's going to be easy," he said. Especially with the increased border security of the last decade, it's almost impossible to cross the border illegally on one's own, Bishop Cantu said, and the human smuggling industry is now controlled by the drug cartels. "It really puts lives in danger."